Choose the wrong swag, and your investment in promotional products could tank. Select the right product, and you’ll gain all of the benefits a well-chosen item offers. In reality, businesses often get caught up in the potential benefits that a promotional product could deliver, and easily fall into the trap of making common mistakes when choosing an item. Instead of reaping rewards, the campaign falls flat. A low-cost method for reaching a wide audience. An interesting alternative to the standard business card. Consumers hang onto the products for a long time. Perhaps your primary audience is professional males. Choosing a kitchen item will not meet the needs of this group. The lesson here is simple: Know thy audience, and then choose the appropriate swag for the group that appeals to their lifestyle, work habits, hobbies or interests. Interestingly, the Promotional Product Association International’s (PPAI) research shows that businesses should place a priority on selecting the right item for the audience – even if it means exceeding your budget. It pays to get a return on your investment, rather than get no return for the product. Keep in mind that audiences generally want to get a useful, valuable item – not a cheap, throwaway item. On the other hand, avoid going overboard with the investment and limiting your reach. There’s a balance desired: Invest in items that are too costly, and you’ll limit reach. There’s one more factor to consider. The product you choose should fit into your business’ larger marketing plan. A clever promotional product that doesn’t integrate with the company’s brand or values won’t get the bang for your buck that you need. On the other hand, a successful marketing campaign will integrate the promotional product so that it blends seamlessly with and supports the business’ overall objectives and mission. It will go above and beyond creating brand awareness. Creating a standout, memorable promotional product pays, making a lasting impression on the recipients and ensuring that brand recall is high – even years later. Custom branding helps leave a good impression, so go beyond stamping the product with your logo. Think outside of the box, and create custom-shaped USB drives or another custom product that surprises recipients. Customized ear buds, one-of-a-kind power banks, personalized flash drives, and Direct Mail Solutions help businesses drive home their branding. Studies have shown, again and again, that consumers place a high value on promotional items that are useful. More than the beauty or intricacy of an object, people want an item they can use – otherwise, it ends up in the trash, along with your branding and investment. It makes sense if you take this logic through to the end: If the item is handy, people will use it, and keep it around their already cluttered homes. Promotional products compete for counter space with the myriad of other home gadgets and tools. In this way, the more useful the item is, the longer it will stay around the home or office – and the more people will think of your brand. There’s a slippery slope when it comes to your promotional product budget. Yes, your product should be able to reach a ton of people, but go too cheap on quality and consumers won’t keep it around. Cheap promotional products wear out, break down and give out. Once it gets tossed in the garbage, recipients won’t have the item around to serve as a reminder of your brand. Without the physical reminder in front of them, consumers will lose track of your business and be more easily swayed to purchase from another vendor or business. Avoid adversely affecting your brand by making the mistake of choosing a cheap promotional product. Choose an item that will make an impression, is useful, and will last a long time. Promotional product companies and experts have a wealth of advice to help businesses just starting out, or even those who’ve tried promotional products in the past with little success, avoid these common mistakes. Going it alone isn’t the best way to market with promotional products. You need the experience of a professional who can help you understand your market, work within your budget, and identify the products that will meet the audience’s needs. More so, a professional can assist you with creating a unique, custom promotional product. A few affordable custom USB products that are making an impression on recipients include USB business cards and environmentally friendly USBs made from wood or bamboo. Your imagination is the only limit as to the ways you can customize a promotional product. Lay the groundwork first before choosing a product, and really get to know your audience. What keeps them up at night? What makes them tick? What products would help them in their daily lives? Then, consider a custom promotional product that ties into your branding and speaks to your target audience. Work with a professional to create a high-quality product that will last, and avoid making the rookie mistake of investing in thousands of cheap USBs that recipients will end up tossing out. Remember, too, that quality trumps quantity. Work with your team to come up with a strategy to balance these guidelines. You’ll be glad you took the time to avoid these common mistakes businesses make when choosing a promotional product, as you’re reviewing the high return on investment the campaign ultimately delivers. Don’t make these mistakes when it comes time to choose your next product campaign. Work with professionals to get the job done right, the first time around. 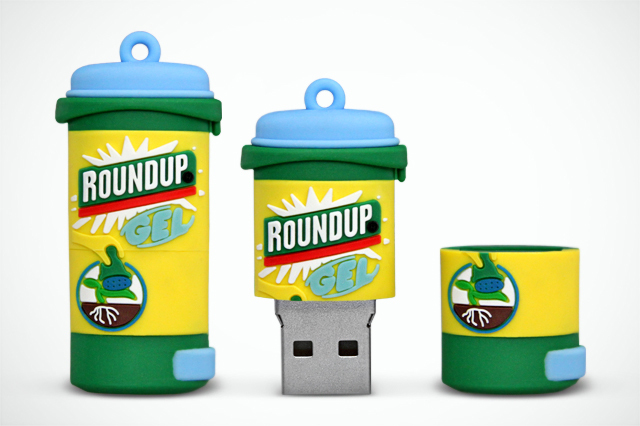 I was unable to find the RoundUp Gel USB shape featured in this blog on your website. Can an order be placed in that shape? Debbie, the Roundup Flash Drive picture above was a 100% Custom Order, therefore it’s not for slae. However, we can make a 100% Custom Flash Drive for you, in any shape you like. Please contact us with the details, you can email us at sales@customusb.com, or use the form on our “100% Custom Shapes Page”.